Stretching the feet, ankles, the plantar fascia of the foot, along with the toes is as important as the rest of your body. 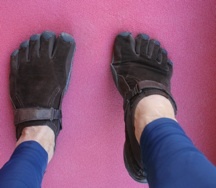 For a barefoot runner (even in protective minimalist footwear), this is especially beneficial for the nerves, tendons, and muscles of the feet to give them a few minutes to warm up before putting them to work. Both beginner and seasoned barefoot runners should do a little stretching before (and after) the run. Stretching the foot is beneficial to all types of runners. For barefoot runners, it is an especially useful habit to develop. Stretching the plantar fascia has been shown to effectively treat 83% of patients (Wolgin, et al) with under-foot pain and also helps to prevent injury by keeping the region flexible and limber. Before rushing into stretching, take a moment to get your blood flowing. Simply find a good flat spot and jump up and down lightly in place. It is good if you can do this on grass, a carpet, or a warm floor. A cold surface could cause the feet to tighten up, instead of loosening. You can jump rope as well; hopping on one foot and switching to the next is also useful. Focus on landing on the forefoot, allowing the pads of your feet to absorb the shock. These tips, hints, and stretches are described in more detail in my barefoot running book, which can be ordered on Amazon. With regard to these barefoot stretches, be as light as possible. The arches will flex slightly. All of the following stretches should be done carefully with methodic precision. The focus for this set of stretches is on the plantar fascia. More stretches focusing on other areas of the foot, heel, and ankle will be outlined later. Do all stretches lightly and never strain. This is especially true for warm-ups. After giving yourself a few minutes to get your extremities warm, you can sit on the ground for this next stretch. I call this the Toe-Back Stretch. I like to do a majority of stretches in minimalist shoes as I have a better grip, my feet stay warm, and for the sake of photos, they are prettier to look at! Without straining your hamstring (you can keep the knee bent slightly), extend one leg out in front of you. Place your hand behind the upper part of the ball of your foot just behind the toes. Bend the toes back slightly, applying light pressure and hold in that position. This backward expansion will help the toes flex antagonistically, which helps to also stretch the upper pad and plantar fascia. Hold this for five to 10 seconds before switching. Repeat once or twice with each foot. Another stretch that not only feels good but also helps to stretch the ball, arch, upper plantar, metatarsal, and lateral malleolus of the ankle is the Upper-Side Stretch. This is also done while sitting. Bring your legs close to your body. Allow the leg of the foot you wish to stretch to remain bent and relaxed on the ground. 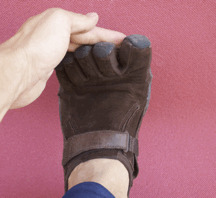 If stretching your right foot, place the four fingers of your left hand on the upper-side of the foot, just at the mid-section below the small toe, an area of the 5th Metatarsal. 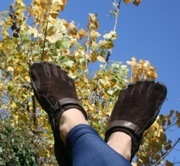 Following, place the thumb of this same hand on the underside of the pad of the big toe. Without pressing, you will not feel anything extraordinary. The stretch, however, takes place by lightly pushing the thumb outward / downward while pulling gently inward / upward with your fingers. Hold the stretch in a comfortable position for five to 10 seconds and rotate. If you experience any pain or discomfort of the plantar fascia, you can always gently massage it with your thumbs. We’ll talk about technique later. A truly beneficial activity is to use a tennis ball (or rubber ball of equal size) to glide back and forth under the mid-section of your foot as you sit on the ground or in a chair. It is handy to keep a ball under your desk at the office or at home. This next stretch, the Slant Stretch, can be done standing up. When first attempting this stretch, however, try it while sitting down. This will allow you to more readily control the pressure placed on the underside of the foot. When done standing, this movement will also help to stretch the calf muscle, along with the Achilles tendon. To do it properly, place the foot against a wall with the heel as close to the wall as possible. The toes will be bent back slightly with the upper pad keeping the foot from sliding. This can be done in minimalist shoes, as you’ll still be able to feel the stretching taking place in the foot. When done in highly cushioned running shoes, unnecessary pressure could be placed on the plantar fascia. Hold this stretch for five to 10 seconds before rotating. When completed standing, the opposite leg will be stretched out behind the body, the foot flat on the ground. The arms will be fully extended, the elbows straight, and the hands shoulder-length apart against the wall (as if you are pushing ever-so lightly through the wall). This final stretch, which we’ll call the Ballerina Stretch, is also done while standing upright. For balance, place your hands on the wall in front of you. Raise the heel of the foot you are stretching off of the ground, putting slight pressure on the ball of the foot, as if you are going to stand on your toes. The knee will bend slightly and can be pushed forward to augment the stretch. Unlike a ballerina, you will only need to do this stretch one foot at a time. Wolgin M, Cook C, Graham C, Mauldin D. “Conservative treatment of plantar heel pain: long-term follow-up”. Foot Ankle Int 1994;15:97-102.